Waitrose is a chain of British supermarkets, forming the food retail division of Britain’s largest employee-owned retailer, the John Lewis Partnership. A nightmare for all supermarkets during the festive period is customer collection of their Christmas turkey, with customers collecting their turkeys in store three days before Christmas. Customers who want to just collect their food and go face spending a long time standing in a queue waiting to be served. This ultimately limits customers’ opportunities to shop around the store and pick up any last minute items still left on their shopping list. It’s a persistent problem for many grocery chains, creating a poor experience for their customers and in some cases reducing the likelihood of customers returning to the store again. In 2015, many retailers had their customers enduring up to 2 hour long queues to collect their turkey, in their precious holiday time before work. To improve their Christmas Turkey collection experience, Waitrose implemented the Qudini System, including a customised self-service kiosk at the front of their store. Customers were able to either enter their unique order number or personal details to check-in, receiving SMS communications notifying their position in the queue and estimated wait time. Customers could also keep track of their position in the queue via a Waitrose branded queue position weblink received via SMS message. Waitrose were able to seamlessly manage and interact with waiting customers. of staff time saved every day. 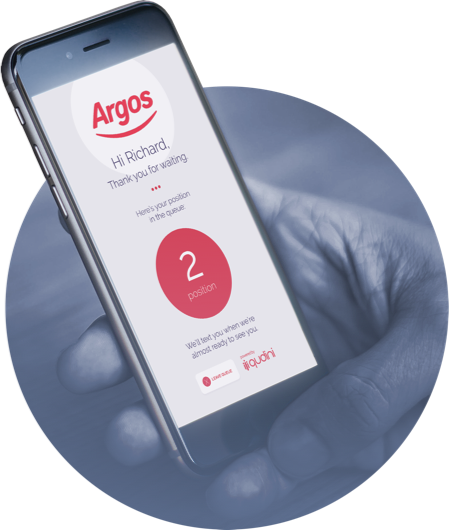 Now that staff were serving each customer 30 seconds faster than other stores without Qudini, in total this saved them an average of 125 staff hours a day that they were able to put to better use. in average queuing time. A significant reduction, compared to other stores where wait times could reach more than 3 hours. of customers in the Waitrose store stated that they would use the service next Christmas. This was 10% more than those surveyed in non-Qudini Waitrose stores. higher satisfaction achieved in the Waitrose store than other stores during the Christmas turkey collection period. This is the first time Waitrose has received useful and valuable data on their Christmas turkey operations and experience. Waitrose believe that the system presents a significant opportunity for saving staff hours and also offers a ‘halo effect’ on sales through increasing customer movement whilst they wait. In non-Waitrose stores, consumers reported lengthy waits to collect pre-ordered goods with queues in some cases stretching outside stores.